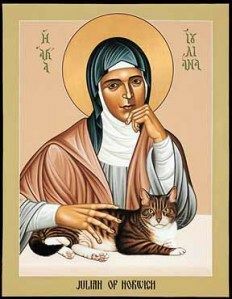 Today is the feast day of Julian of Norwich who was, somewhat confusingly, given the name, a woman. We don't know her actual name because she was renamed after the parish church to which her small dwelling was attached. She was a remarkable Christian of the 14th century, an anchorite or solitary. She lived with her cat and welcomed visitors for spiritual counsel and prayer. Julian's Revelations of Divine Love may be the first book in the English language known to have been written by a woman. 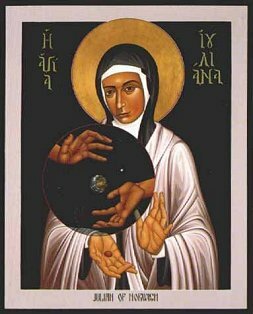 Julian was also known as a spiritual authority within her community, where she also served as a counsellor and advisor. She is held in high regard venerated in the Anglican and Lutheran churches and we're fond of her in our United Church as well. Perhaps she was a little too independent in her thinking to be canonized by the Roman Catholic church. She wrote, imaginatively that Jesus was our mother and our brother and saviour. She often wrote about God using maternal language. For a long time I had the Robert Lenz icon of Julian holding a hazelnut as the cover of my appointment book. She wrote of a vision of the small and insignificant nut as a symbol of both the smallness and greatness of all things as they are encompassed by God's love. I looked thereupon with eye of my understanding, and thought: What may this be? And it was answered generally thus: It is all that is made. for methought it might suddenly have fallen to naught for little. And I was answered in my understanding: It lasteth, and ever shall for that God loveth it. And so All-thing hath the Being by the love of God. Perhaps we can all honour Julian today by our prayerful awareness of God's divine presence in what we might otherwise pass by without consideration.